High protein salad for the Gods! 🙂 One of the dishes Amma prepared for Ganesh Chaturthi as part of the naivedyam was boiled black chickpeas (Kala chana) tempered with spices. Goes by the name ‘Guggulu’ in parts of Andhra. We at home call it ‘Talimpu Senagalu’. Aromatic curry leaves make a great pair with chick peas. “Less is more” – drizzle of oil, dash of asafoetida, mustard seeds, cumin seeds, split gram dal, green chillis and a sprig of curry leaves is all it takes to match the nutty flavor of boiled chick peas. 1 Pressure cook chick peas till soft. Add salt and combine. 2 Drizzle oil in a pan, add mustard seeds and let them pop, add the urad dal and as it turns red, add the asafoetida, chopped green chillis and curry leaves. Saute for 15-20 secs. Add the cooked chick peas and combine. Adjust salt and turn off heat. Note: Grated coconut is optional. Add 2 tbsps of grated coconut and combine. Vinakaya Chavithi neivedyam recipes blogged ~ Paala Undrallu, Kudumulu, Uppu Kudumulu, Undrallu, Atukulu Payasam and Pulihora. 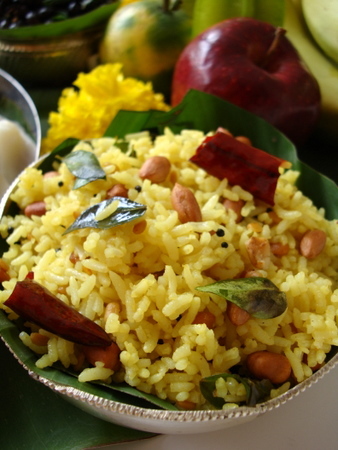 We make this too but with coconut and for Navarathri. I remember this naivedya.. and i am more and more convinced with your recipes and foods prepared for different festivals that andhra cuisine has a lot of similarities with maharashtrian food.. Mouth watering Pics Sailu !! Hope you had a wonderful Vinayaka Chavithi !! Pictures on your website are amazing as always! Many thanks for the neat tips you post in your blog. Is that a real banana leaf bowl that senagalu are in or, an artificial one? If a real one, would you mind disclosing how you make that bowl? Thanks a bunch in advance!! Your welcome. That’s a real banana leaf shaped into a cone and placed in the silver bowl. WOW!!! I love this.. so tasty. My favourite….just wondering about Nehal’s birthday this year…..whatz the theme..would luv to see the pictures too. Do we soak the Kala Chana in water first & then pressure cook or it can be cooked without soaking? Soak the kala chana in water for 6-8 hrs before pressure cooking. 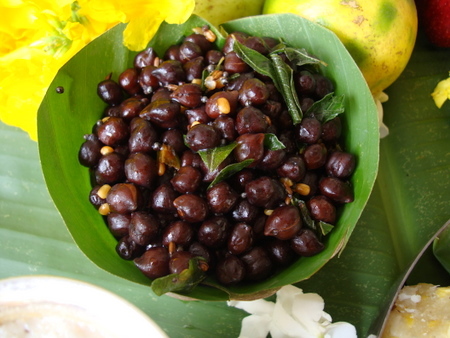 Nice clicks, Black channa looks delicious and yummy. Even I did the same sundal(tamil version)on Ganesh chathruthi. But I ground coconut, cumin seeds and dry chillies and mixed the mixture after tempering the sundal. I tried it for the first time. Turned out good. This is one of my favorite dishes 🙂 I even love to have it as a evening snack with tea! I’m learning to temper oil with various ingredients and I marvel at the fragrances that fill the kitchen. But I’m uncertain how to use dal in tempering. In this recipe, should I simply add split dal as is? Or should it be ground to a powder first? Can I substitute masoor or moong dal for urad without greatly altering the dish? I do like the nutty flavor of kala chana and look forward to trying your recipe. Yes, Greg, the aroma of tempering is enticing. Add split dal as it is and on low to medium flame, let it turn red. You cannot substitute masoor or moong dal for urad in the tempering. You have to use only urad dal. In case you do not have urad dal on hand, omit it and follow the rest of the procedure.